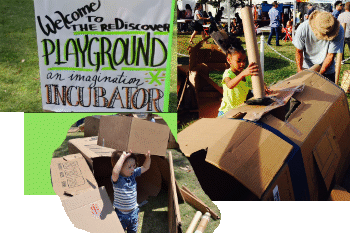 reDiscover provides all materials and tools necessary for children to create large and small structures, sculptures, inventions, and other explorations of hands-on materials. 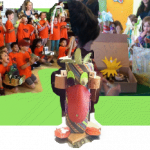 Our materials include cardboard boxes, cardboard tubes, bamboo, fabric, mylar, rope, inner tubes, and lumber. Inspirational and safety guidelines posters define a temporary space and establish habits of cooperative play. Great for recess enrichment, fundraisers, and special events.